Slowly it's time to plan our trip to Scotland this year. In the process, many memories of April last year are awakened. Once again, I would like to thank my wife for making this life's dream come true. Thank you my darling, I love you! 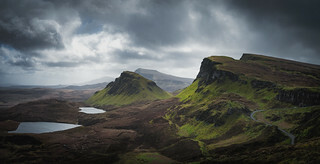 I will never forget the breathtaking view over the Quiraing. And at the same time, I'm looking forward to the next time. And no matter whether it is snowing, stormy, rainy or sunny. This area has its charm with every weather.